Today Brinkvision unleashes the dark and tense building bigfoot feature from Dan Riesser STOMPING GROUND. It heads to DVD on VOD and follows a group in search of old Mr. Sasquatch. When tensions begin to rise in the group the task at hand becomes even deadlier seeking the truth. 100 of the first DVD’s come with a signed poster so head over and get yours now. The Bigfoot movies are rolling stronger than ever so if you are a fan of the folklore rent or watch this one today and check out this new clip! 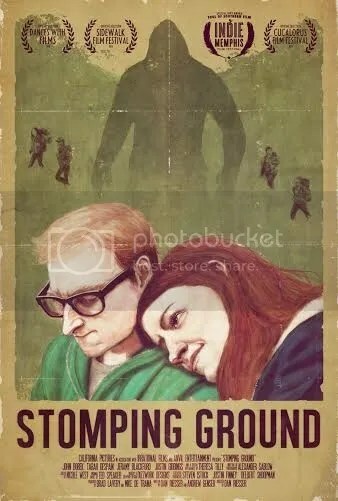 BRINKvision is proud to announce the March 8th DVD and Video-On-Demand release of Stomping Ground, an independent Bigfoot horror feature by writer/director Dan Riesser. Mike De Trana produced through Anvil Entertainment. Stomping Ground is the story of Ben and Annie, a young couple on a weekend trip to Annie’s small North Carolina hometown. At the local bar they run into Paul, a charming old friend of Annie’s, and Ben learns something he never knew about his girlfriend: She believes in Bigfoot. In fact, she and her friends used to “hunt” for the creature when they were kids. Before Ben knows it, he’s off on an impromptu Squatchin’ trip deep in the Carolina backwoods. Amidst the Squatch calls, campfire stories and beers, Ben quickly realizes that Paul may have an ulterior motive in bringing Annie to the woods. And something else out here seems to be after her as well. Everyone but Ben thinks its Bigfoot. But it can’t be, can it? After all, Bigfoot isn’t real. The film features a cameo performance from Theresa Tilly, best known as one of the original “Ladies of the Evil Dead” from Sam Raimi’s horror classic, The Evil Dead. The film world premiered at the 2014 Dances With Films Festival in Hollywood, CA and received the “Soul of Southern Film Jury Award” at the 2014 Indie Memphis Film Festival. Filmmaker Dan Riesser, formerly an Emmy-nominated producer on E! Entertainment’s The Soup with Joel McHale, wrote, directed and produced Stomping Ground as his first feature film. 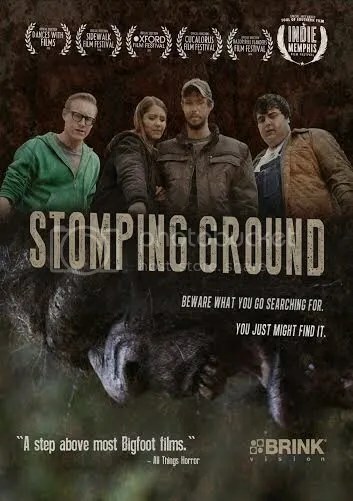 Stomping Ground cast and crew members – including Riesser and Tilly – will celebrate the film’s release with a signing at Dark Delicacies in Burbank, CA on March 8th at 7pm. The cast and crew will also be in attendance for a special screening of the film at Laemmle’s Playhouse 7 in Pasadena, CA on March 10th at 7:30pm. The film is also available on Amazon. It will be available digitally from Amazon Prime and Google Play on March 8th, with additional VOD outlets to follow. The film is available for Cinema-On-Demand screenings through Tugg.com.